16763 ft (5109 m) Highest point in Congo and Uganda . 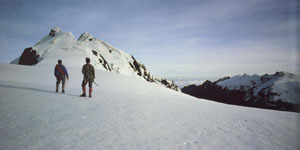 The Ruwenzori (or Rwenzori) is the only truly alpine, glaciated mountain range in Africa, the third highest group overall on the continent behind Kilimanjaro and Mount Kenya. The mountains have been famed since antiquity as the "Mountains of the Moon", the distant unknown source of the Nile River, and they are the wettest mountains in East Africa, shrouded in clouds and mist for most of the year. 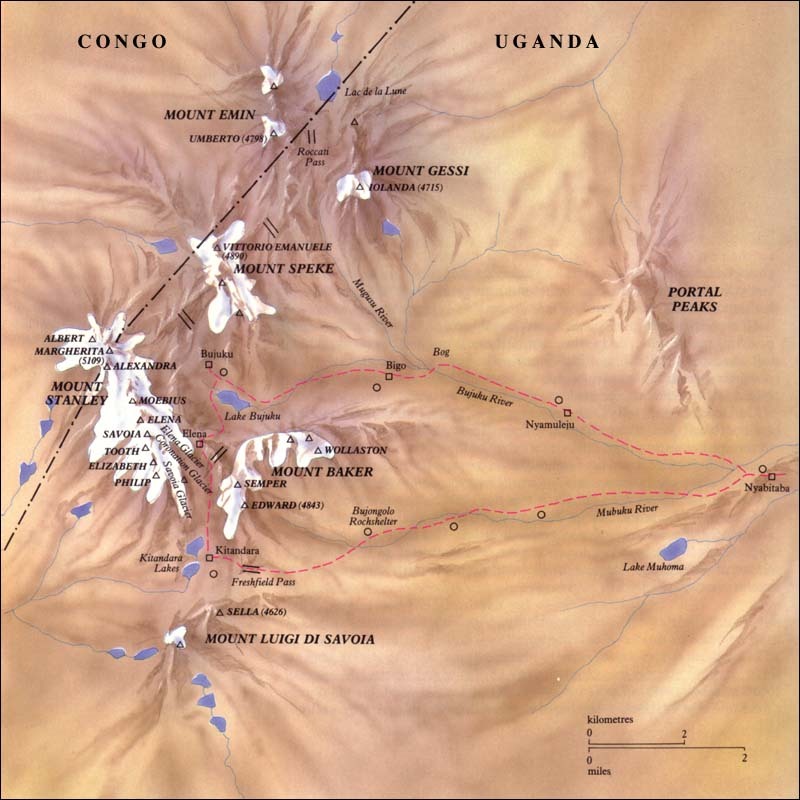 There are six major glaciated mountain masses in the upthrust fault-block which forms the Ruwenzori, with a total about two dozen peaks higher than 15000 ft (4600 m) and with over 40 glaciers. 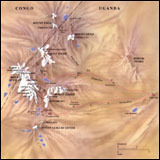 Mount Stanley is the largest and highest of these mountains, with the greatest extent of glacial ice and the three highest peaks in the range. Like all tropical glaciers around the world, the glaciers of the Ruwenzori have shrunk substantially since the mid-19th century, and now there are less than 2 square miles (5 sq km) of ice cover left. During the two rainiest seasons (March-May and September-October), snowpack accumulates as low as 14000 ft (4300 m), and so ski descents of up to 2500 vertical feet (800 m) may be possible.